First published in 1940 and this edition in 1987, this book is a comparative study of African political institutions. 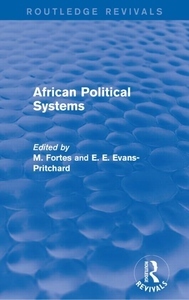 It describes different types of social organisation that are found in a number of African societies and analyses the principles underlying these traditional forms of government. The volume represents the results of field studies carried out by trained investigators in a number of areas, and was compiled and edited under the auspices of the International African Institute. It will be of interest to students, anthropologists and administrators.